Invitation: Concert "RybaNaRuby & Brikcius: Bach & Cello I." 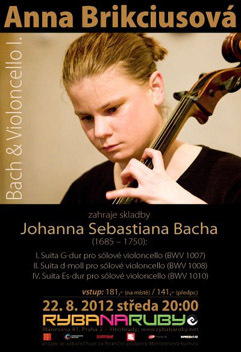 You are invited to the "RybaNaRuby & Brikcius: Bach & Cello I." concert featuring Czech cellist Anna Brikciusová, held on 22nd August 2012, 8pm, at the RybaNaRuby (Mánesova 1645/87, Praha 2 - Vinohrady, 120 00, Czech Republic). Cellist Anna Brikciusová will play Suite No. 1 in G major for solo cello (BWV 1007), Suite No. 2 in D minor for solo cello (BWV 1008) and Suite No. 4 in E-flat major for solo cello (BWV 1010) by baroque composer Johann Sebastian Bach (1685 - 1750). Next concert "RybaNaRuby & Brikcius: Bach & Cello II." (František Brikcius - Cello) will be held on Friday 28th September 2012. Tickets (entry fee: 181 CZK / advance booking: 141 CZK) and reservations available at the door. In cooperation with the RybaNaRuby. Further details on websites http://www.Brikcius.com , http://www.RybaNaRuby.net , http://www.FaceBook.com/RybaNaRuby (FaceBook event here), http://www.FaceBook.com/Brikciusova . "RYBANARUBY & BRIKCIUS: BACH & CELLO I." Competition: Win 1 x 1 CD "MAKANNA"
Who is the author of the music CD "MAKANNA" (Jan Talich - Conductor, František Brikcius - Cello, Jan Židlický - Narrator & Talich Chamber Orchestra)? Contest is over, lucky winner is J. G. from Madrid. RybaNaRuby is multicultural experimental space, featuring concerts, lectures, courses, seminars, improvised performances, literary evenings and film screenings. For more details visit websites http://www.RybaNaRuby.net , http://www.FaceBook.com/RybaNaRuby & https://Twitter.com/Rybanaruby . An orange is type of citrus fruit from the orange tree (Citrus sinensis) from the family Rutaceae (Rutaceae). It is probably originated in subtropical climates in South East Asia, border of China and Vietnam. Imported to Europe during the 15th century by the Portuguese. From Europe, orange trees were taken to America. Orange trees are widely cultivated in subtropical climates. It is the most commonly grown tree fruit in the world. Orange trees are evergreen flowering trees generally growing to 9 - 10 m in height (although very old specimens have reached 15 m). The leaves are arranged alternately, dark green shiny, ovate in shape with crenulate margins and are 4 - 10 cm long. Small white flowers with five petals smell very sweet which attracts many bees. Oranges are round orange-coloured fruit (hesperidium) grow to different sizes (5 - 12 cm). An orange has a tough shiny orange skin (perikarp). Inside, the fruit is divided into segments, which have thin tough skins that hold together many little sections with juice inside. There are usually ten segments in an orange, but sometimes there are more. Inside each segment of most types of orange there are seeds called pips. The segments and the skin are separated by white stringy fibrous material called pith. Oranges, as with most citrus fruits, are a great source of vitamin C. The fruit is commonly peeled and eaten fresh, or squeezed for its juice. Almost 99% of the fruit is industry processed. Pericarp is a source of pectin and essential oils. 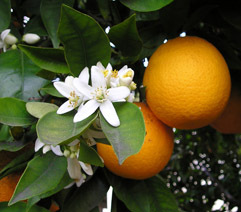 Blossoms are dried and then used to make tea, orange blossom essence is an important component in the making of perfume. - Common oranges (also called "white", "round" or "blond" oranges) make up about two-thirds of all oranges grown and include all oranges not described in one of the other three groups. They are used primarily for juice production. - Blood oranges (or sanguine orange) often have red marks on the skin, and some parts of the inside look as if they have blood in them. Some blood oranges make juice that is ruby red. Original blood oranges were first discovered and cultivated in the 15th century in Sicily; since then, however, their cultivation spread worldwide, and most blood oranges today are hybrids. - Navel oranges are characterized by the growth of a second fruit at the apex, which protrudes slightly and resembles a human navel. They are primarily used for eating, as the skin is thicker and easier to peel than a common orange, they are less juicy, and a bitterness from limonin during processing renders them less satisfactory for juice. In 1820, in Brazil, there was a tree growing in a monastery garden that made very strange fruit. The mutation left the fruit seedless. Today, navel oranges continue to be produced through cutting and grafting. This does not allow for the usual selective breeding methodologies, and so not only do the navel oranges of today have exactly the same genetic make up as the original tree, and are therefore clones, all navel oranges can be considered to be the fruit of that single nearly two-hundred-year-old tree. Over 60 million tons of citrus fruit a year are harvested worldwide. Nearly 70% goes to oranges. One average orange tree provides 7 000 oranges a year. The colour orange takes its name from the fruit. The word "orange" is unusual because it is one of only a few English words that does not rhyme with anything. For more information about Orange visit http://www.Brikcius.com and http://En.Wikipedia.org/Wiki/Orange_(fruit) .